KIND Bars are a convenient, decent tasting, relatively healthy "on the go" alternative to other snacks since they're mostly made from whole foods. One of KIND Snacks' slogans is "ingredients that you can see and pronounce" and this is generally true. Most ingredients are simple, whole foods. They're very convenient when you don't have time to prepare a real meal. They're very convenient during a workout or hike when your hands are dirty. They're a good source of fiber with 7g (28% DV) of fiber. They're low in sodium with just 20mg (1% DV) of salt. They contain at least 3 added sweeteners: honey, non-GMO glucose, and sugar. Sweeteners improve taste and are okay in moderation. However, sweeteners also add unnecessary calories, often make you hungry, and raise your blood sugar. They contain at least 5 potential allergens: almonds, cashews, peanuts, pecans, and soy lecithin. MIXED NUTS (PEANUTS, ALMONDS, PECANS, CASHEWS), CHICORY ROOT FIBER, HONEY, PALM KERNEL OIL, SUGAR, NON GMO GLUCOSE, CRISP RICE, COCOA POWDER, CINNAMON, SOY LECITHIN, MILK POWDER, SALT, VANILLA EXTRACT. We believe KIND Bars are healthier than many other types of snacks because they're made from quality ingredients and don't contain large amounts of sweeteners, excessive calories/salt, or other additives. However, we believe they're slightly less healthy than eating the core whole foods (nuts or grains) without extra ingredients. Yes. KIND Bars do not contain genetically modified ingredients. From KIND's Ingredients FAQ: "All KIND® snacks do not contain genetically engineered ingredients. The Non-GMO Project seal appears on the majority of our KIND Healthy Grains® and Pressed by KIND® products. Some of our other snacks are pending Non-GMO Project certification." No. KIND Bars are not organic. From KIND's Ingredients FAQ: "We are not currently pursuing organic certification for our snacks. Our top priority is to invest in high quality, premium ingredients, while keeping our products accessible. We work closely with our suppliers to ensure that their standards are in line with KIND’s brand values." Are Dark Chocolate Cinnamon Pecan KIND Bars vegan-friendly? No. Dark Chocolate Cinnamon Pecan KIND Bars are not vegan-friendly because they contain honey and milk powder. Are Dark Chocolate Cinnamon Pecan KIND Bars gluten-free? Yes. Dark Chocolate Cinnamon Pecan KIND Bars are gluten-free. All 17 ingredients are gluten-free. Are Dark Chocolate Cinnamon Pecan KIND Bars dairy-free? No. Dark Chocolate Cinnamon Pecan KIND Bars are not dairy-free because they contain milk powder. Are Dark Chocolate Cinnamon Pecan KIND Bars keto friendly? No. Dark Chocolate Cinnamon Pecan KIND Bars are not keto friendly because they contain chicory root fiber, honey, sugar, non-GMO glucose, and crisp rice. Are Dark Chocolate Cinnamon Pecan KIND Bars lactose-free? No. Dark Chocolate Cinnamon Pecan KIND Bars are not lactose-free because they contain milk powder. Are Dark Chocolate Cinnamon Pecan KIND Bars paleo? No. Dark Chocolate Cinnamon Pecan KIND Bars are not paleo because they contain mixed nuts, peanuts, palm kernel oil, sugar, non-GMO glucose, crisp rice, soy lecithin, and vanilla extract. Where can I buy KIND Bars? 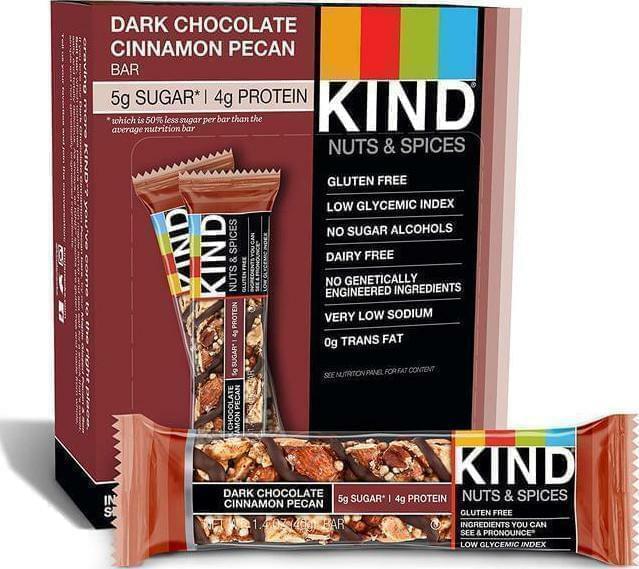 KIND Bars are available on Amazon, Walmart, Target. Dark Chocolate Cinnamon Pecan KIND Bars are made by KIND Snacks.